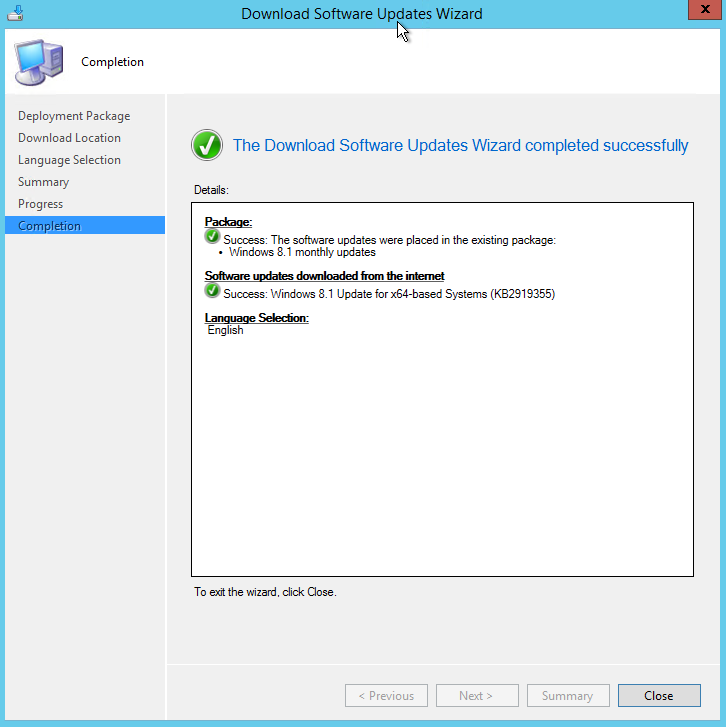 This post we discuss how to update your Windows 8.1 image with Update 1 in SCCM 2012 R2. 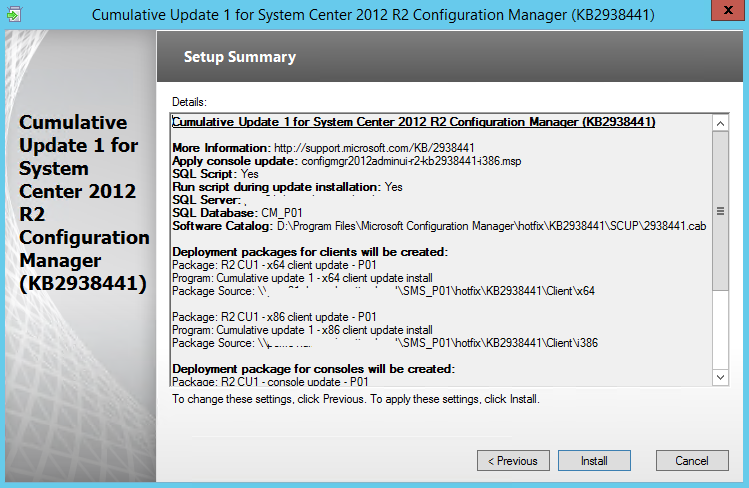 In most environments this update isn't downloaded automatically with any ADR(due to the update classifications set in it). You need to manually download the update. 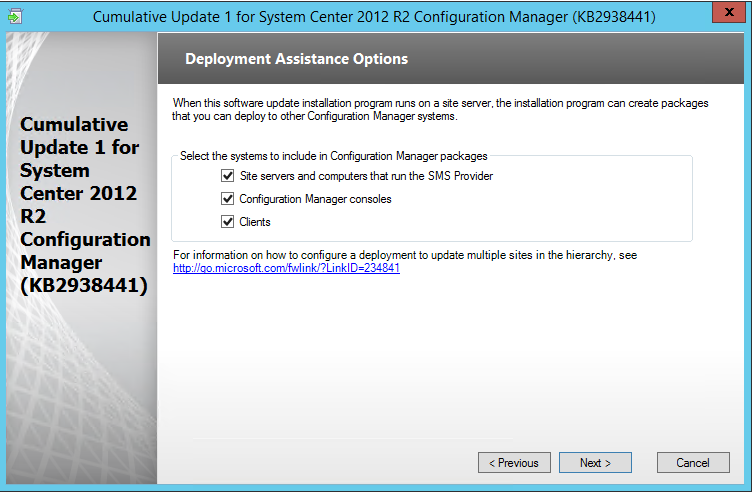 Also, make sure that at least the KB2919442 update has been installed (servicing stack update) in your image. First, open the SCCM 2012 console. 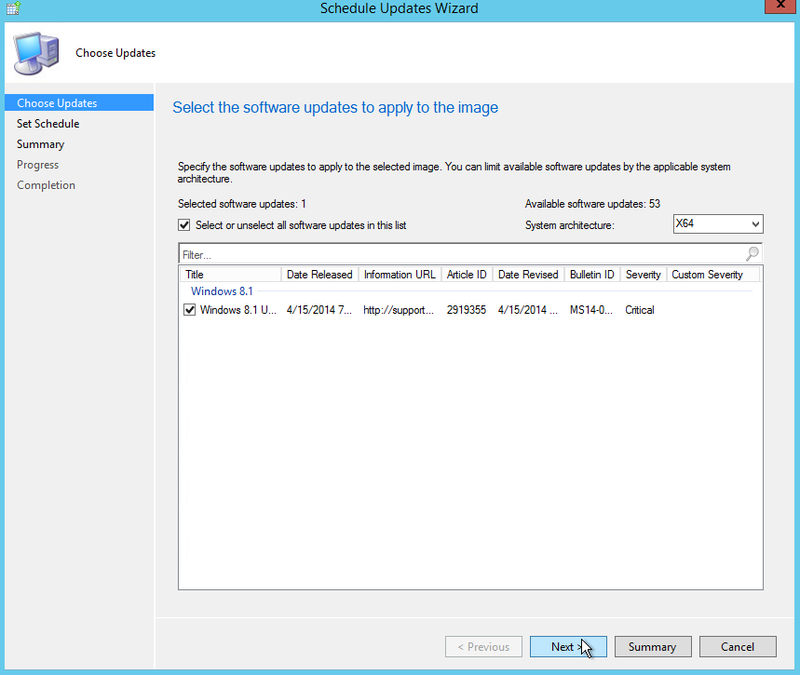 Navigate to Software Library > Software Updates > All Software updates. 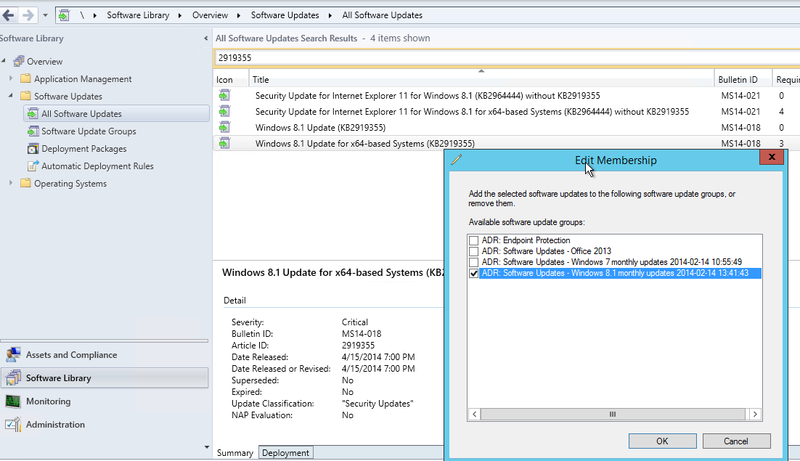 Search for KB2919355 and hit enter (this is the Update 1 update). Rightclick it, and select download. 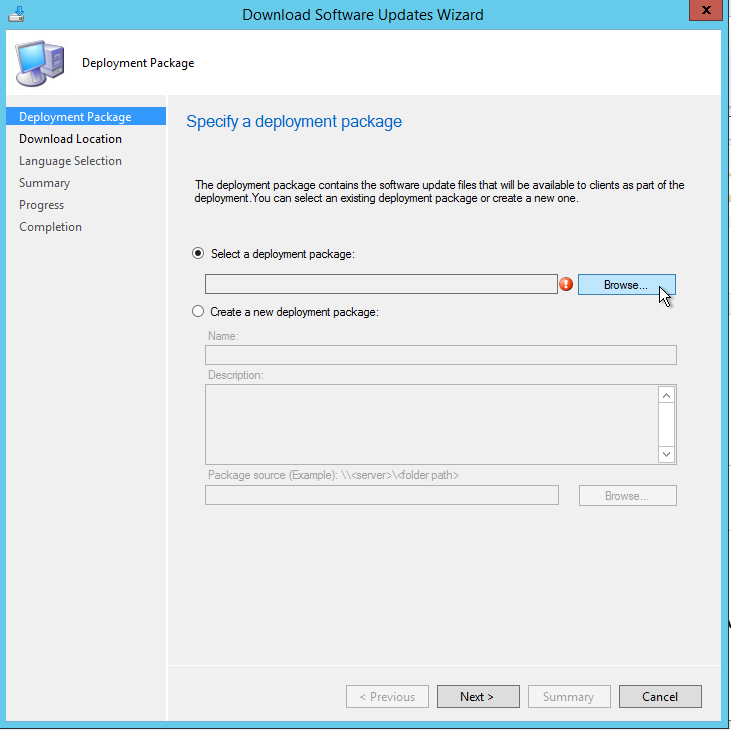 Then, choose the deployment package you want to use. 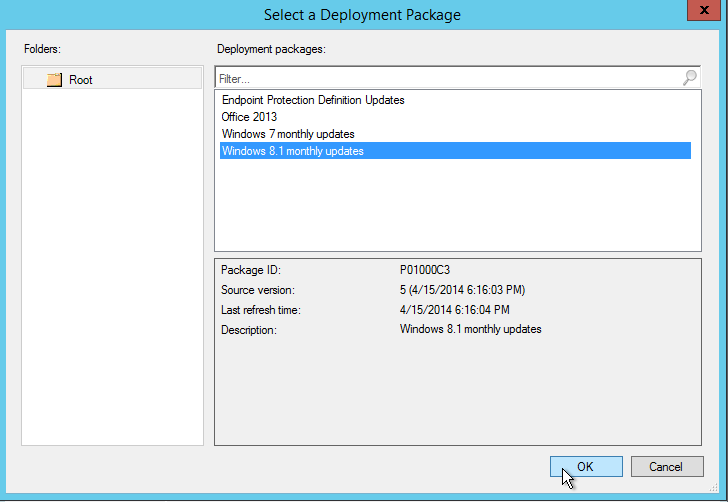 In the example, we chose Windows 8.1 monthly updates. If needed, select extra languages. Then click next when done. Check the overview to see what actions are going to be done. Click Next. Once done, you should receive a screen looking like the one below. Now rightclick the update, and select 'Edit Membership'. 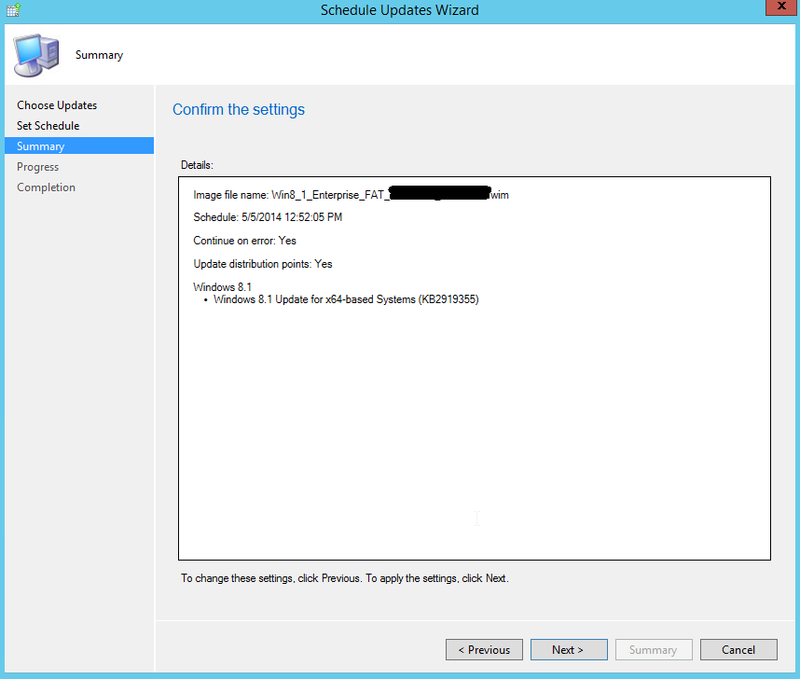 Choose the ADR rule you want, and select OK.
Now you can add the update to an image using Offline Servicing. Go to Software Library > Operating Systems > Operating System Images. 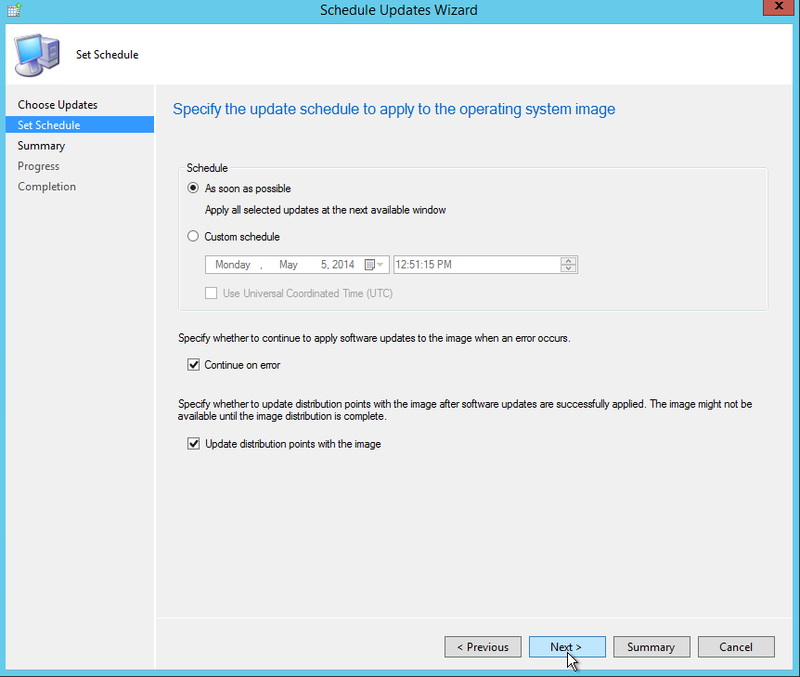 Rightclick the image you want to update, and select Schedule Updates. In this post we are going to discuss how to create a clean software packaging environment, or package street/package factory. 2). Choose an Operating System. Preferably Windows 7 32-bit or 64-bit (depends on what environment is most used in your company, possibly both are needed). 5). 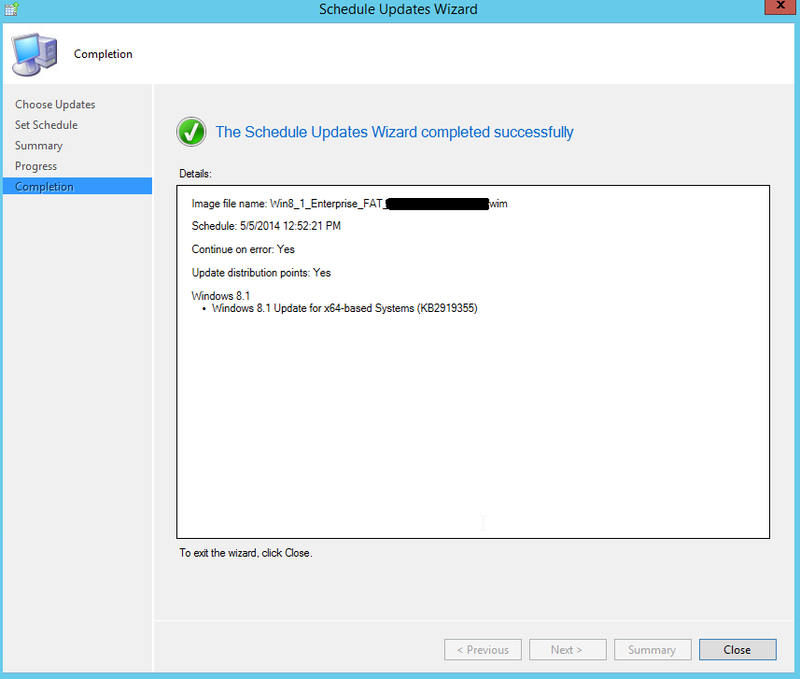 Turn Off Automatic Updates then Run Windows Updates but only Security Updates, Service Packs, and other Critical Updates. 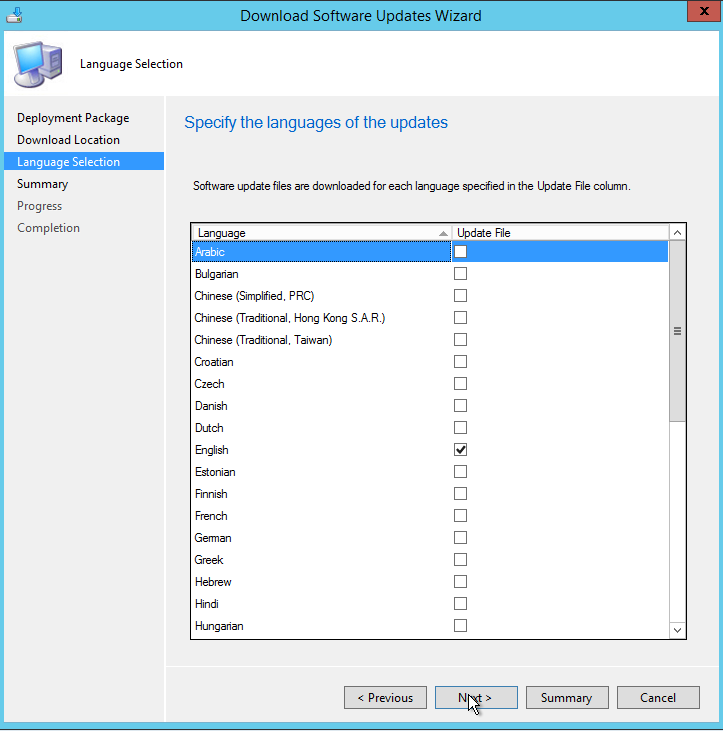 Avoid Language Packs, Windows Defender, Internet Explorer Updates, and Driver Updates. You are best off not installing any dependencies like Visual C++ or .NET Framework. In this case, if your software complains then you'll know what .NET Framework your software package needs. You can then add it as a dependency (for instance when creating the package using Adminstudio). 7). 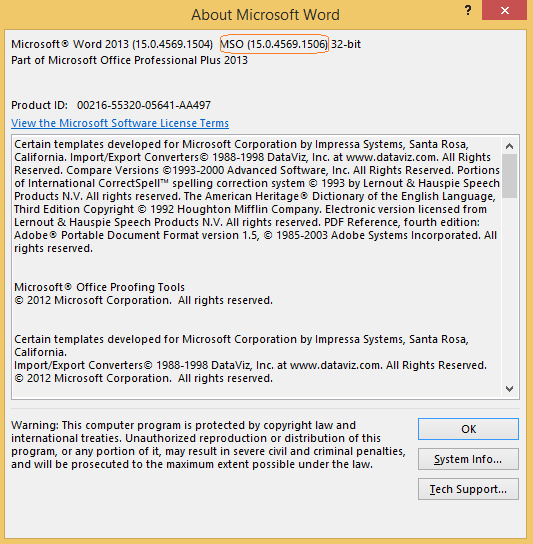 Disable Extra Features from Programs / Add or Remove Windows Features you will not need. It is necessary to create a reference computer that is as clean as possible. 8). Create your page file. You may need to format your 6GB Hard Drive. 9). Turn off Services you don't need. Services.msc Double click a service, Choose Disabled, Click Stop, Click Apply. 12). Add anything else you think you may need. Now you can configure your Machine how you want it. 13). Shutdown the machine and create a snapshot/checkpoint. Now you can use your MSI creating tool, and create snapshots when done. You can also use this machine to create captures. Cumulative update 1 (CU1)(KB2938441) for SCCM 2012 R2 has been released! 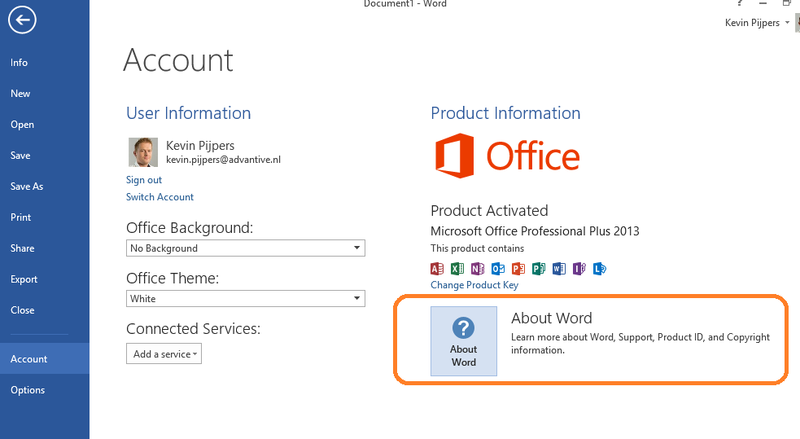 See this link for the Microsoft documentation. 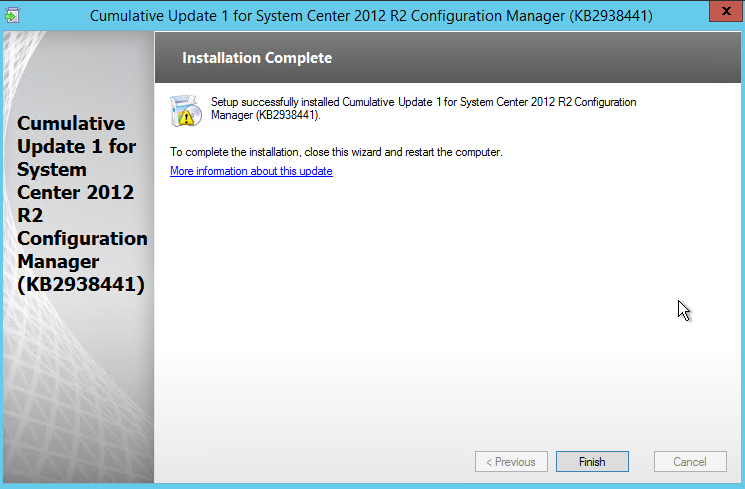 In this blog we'll describe how to install this CU. 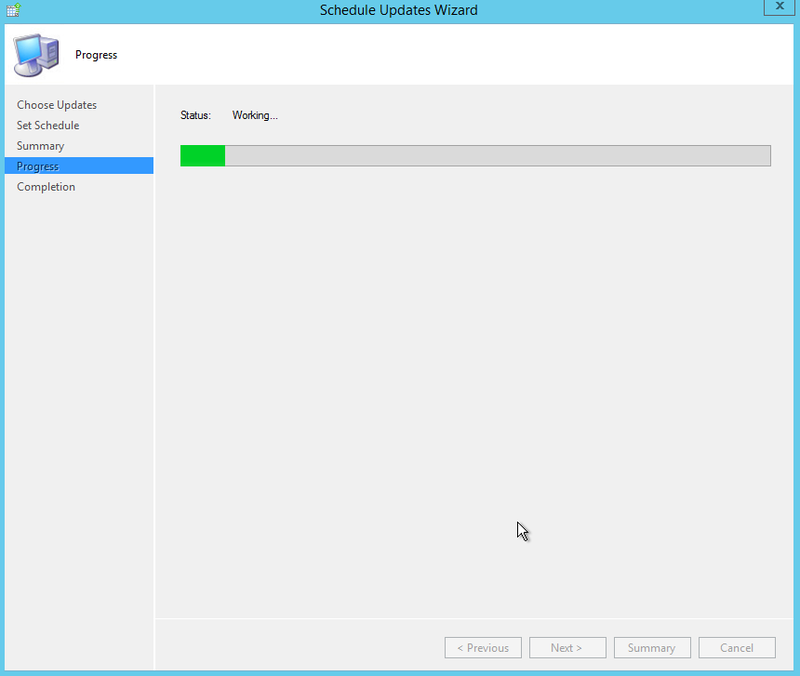 First, make sure you pick an appropriate time to install this update (preferably after Office working hours). 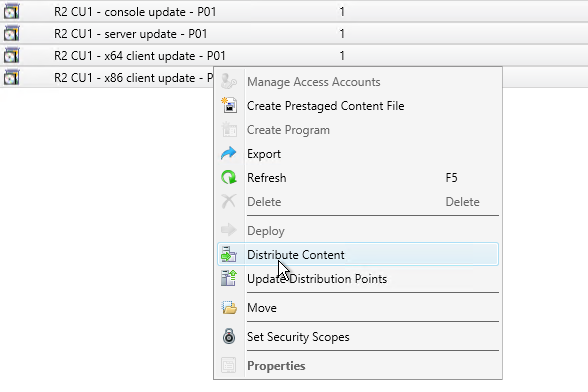 Second, make sure you create a backup / snapshot / checkpoint before proceeding with installing this CU. 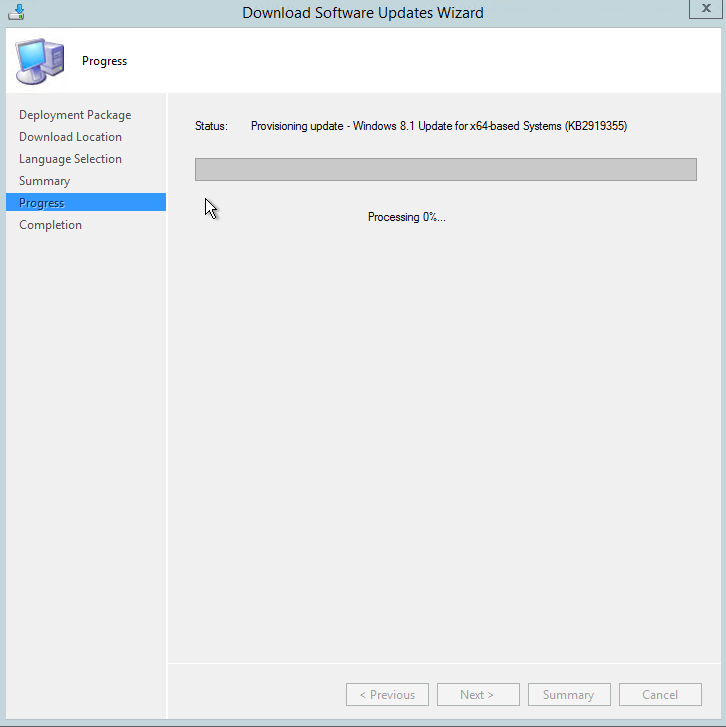 Extract the update by doubleclicking the executable, or by rightclicking it, and extracting it manually. Click 'I accept', and click Next. If all the prerequisites have passed, click Next. 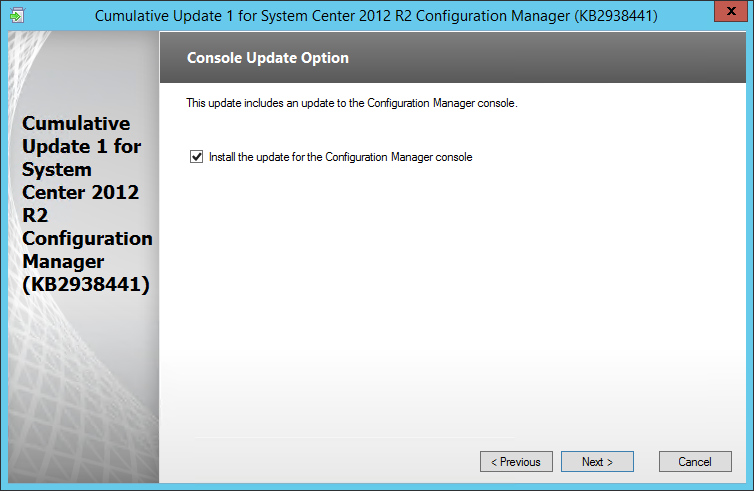 Check the box to update the console, and click Next. 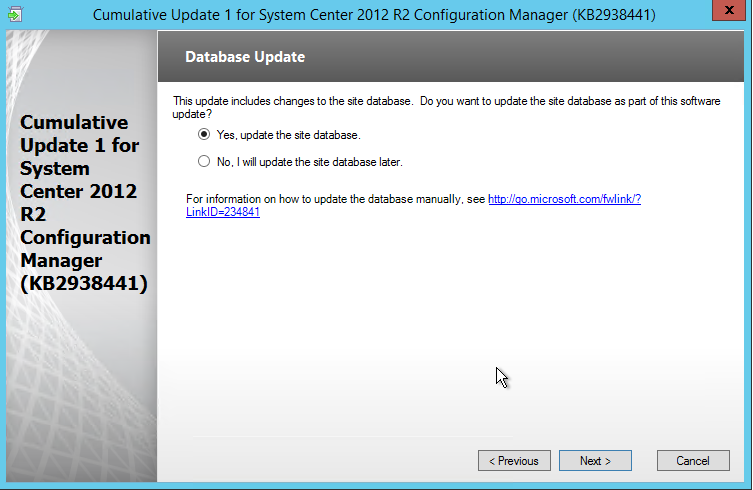 Click the 'Yes, update the site database' radio button, and click Next. Leave all the checkmarks, and click Next. 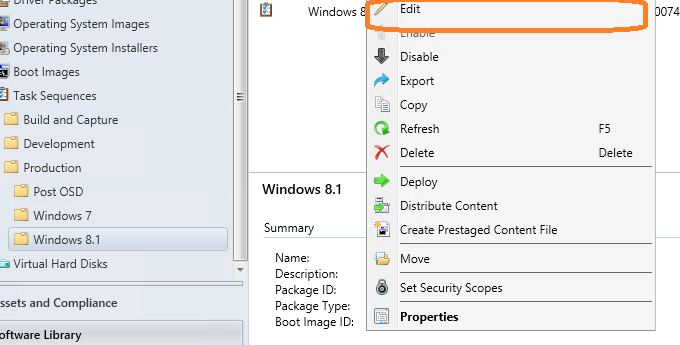 Change the Package name if desired. Change the Package names if desired. Review the Setup summary. 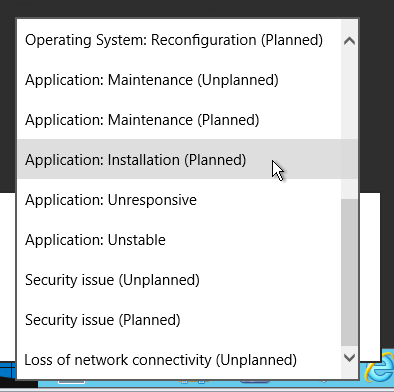 If everything is OK, click Install. Monitor the progress of the installation. Click 'View log', to monitor all the components using CMTrace. 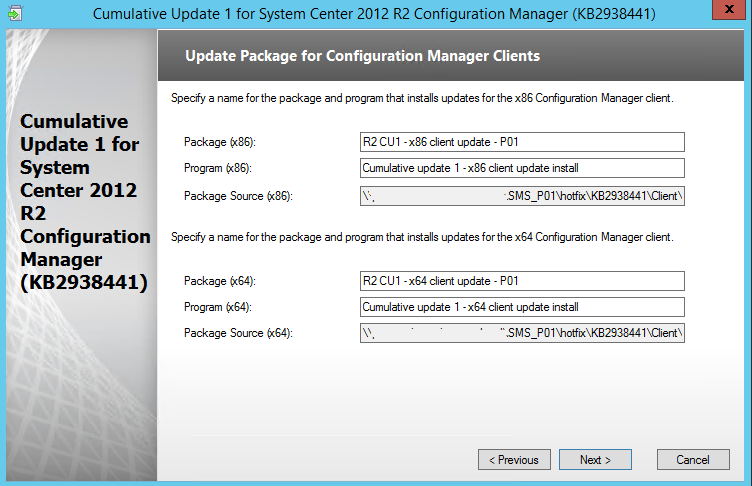 Check the version by opening the SCCM Console, and click About. The version should be 5.0.7958.1203. 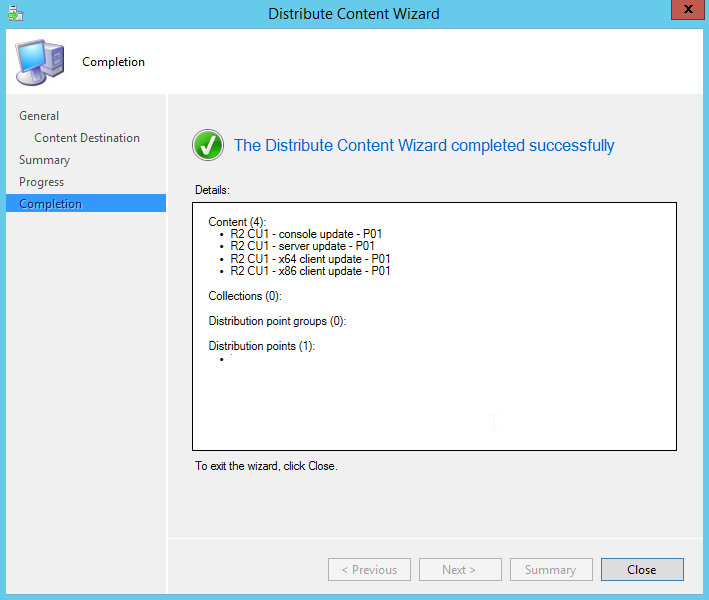 Next, select all the CU1 packages, and click Distribute Content. 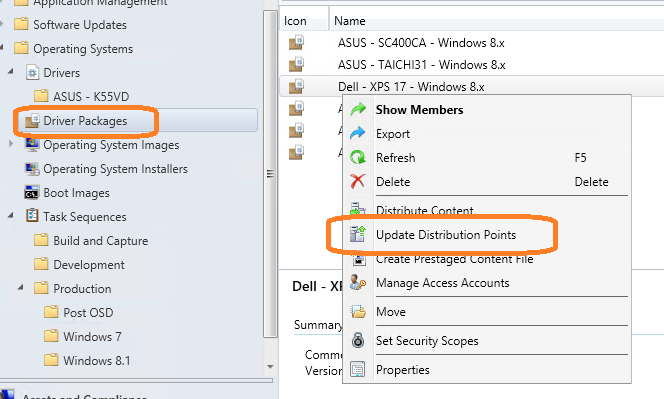 Add distribution point(s) and click Next. Review the summary, and click Next. Once done, click close. 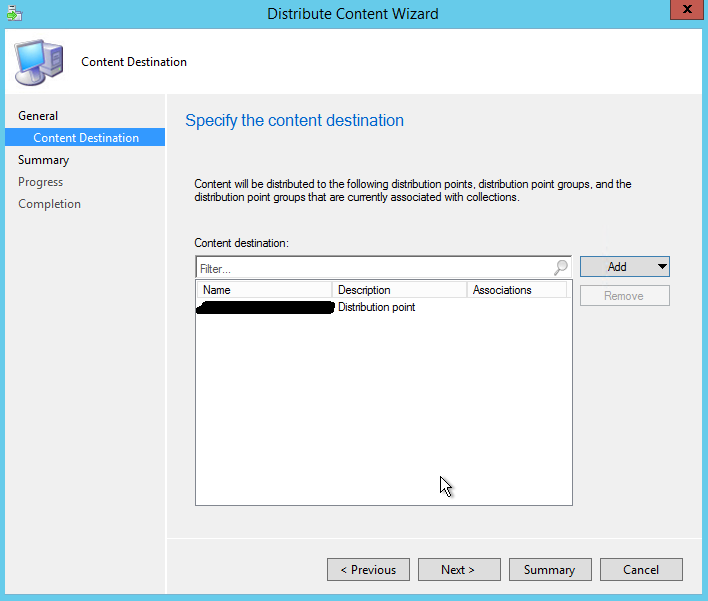 You can then deploy the packages to the appropriate device collections if desired. Optionally you can check the Site status and Component status in the Monitoring pane. 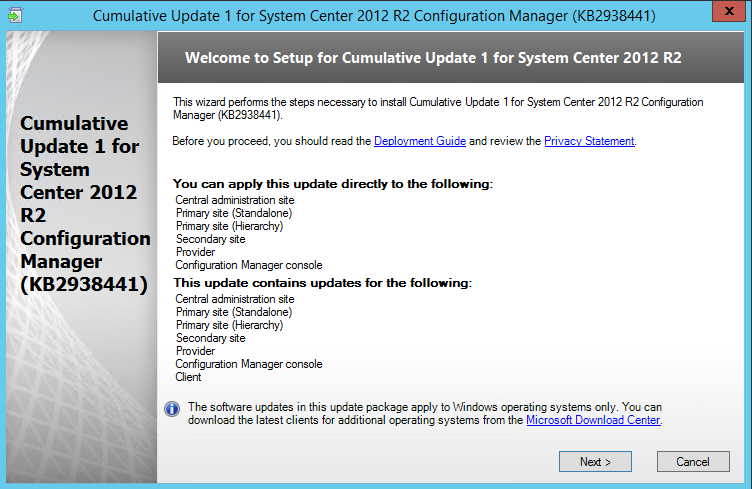 Note: The CULevel value is set to 1 for Cumulative Update 1. 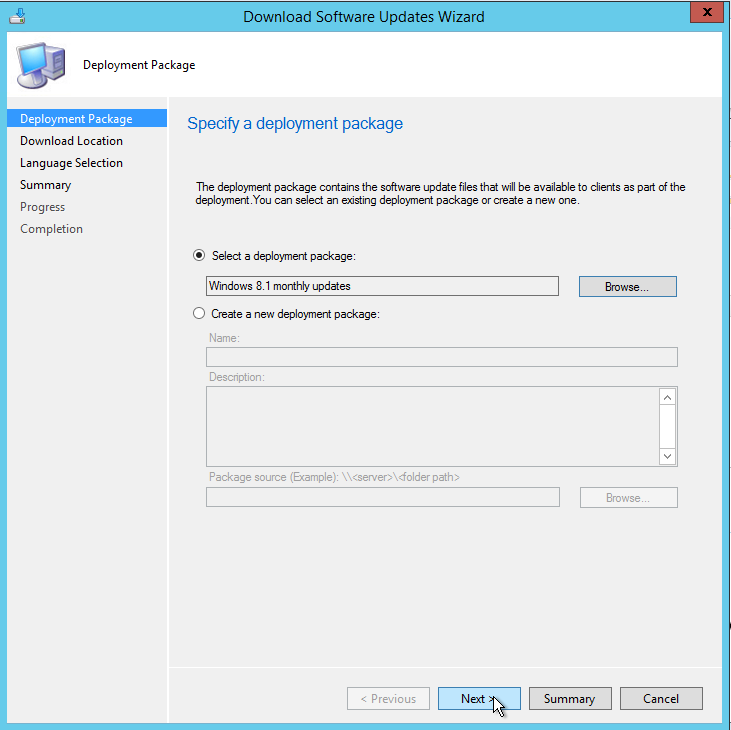 In this post we'll discuss how to slipstream SP1 into your Office 2013 installation. 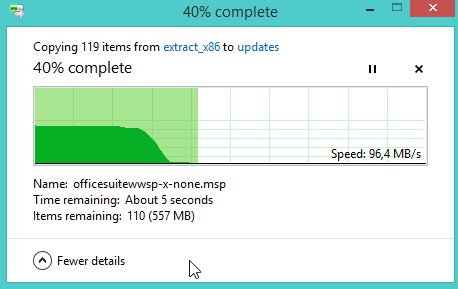 The great benefit of this is that after installing Office 2013, it's at SP1 level, so that you don't need to install so many updates after your base installation. 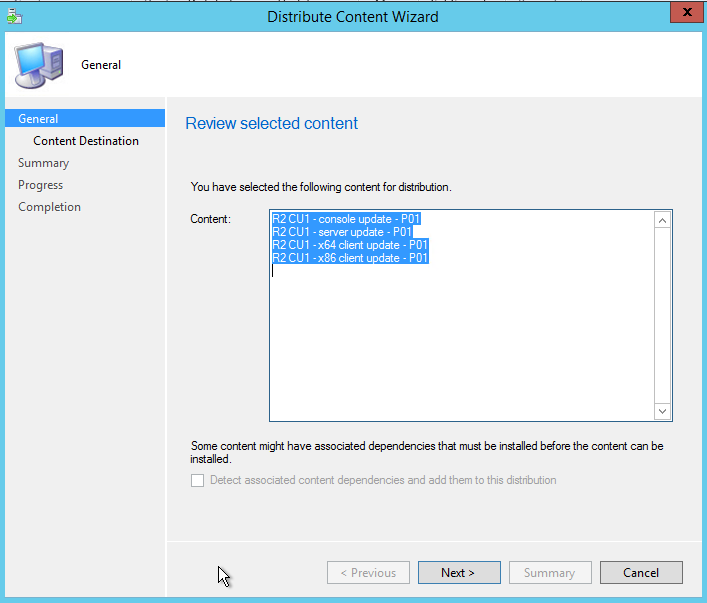 Copy the content of your Office 2013 DVD to the appropriate DVD folder. Use the following commandline to extract the contents of the Service Pack to the extract folder. 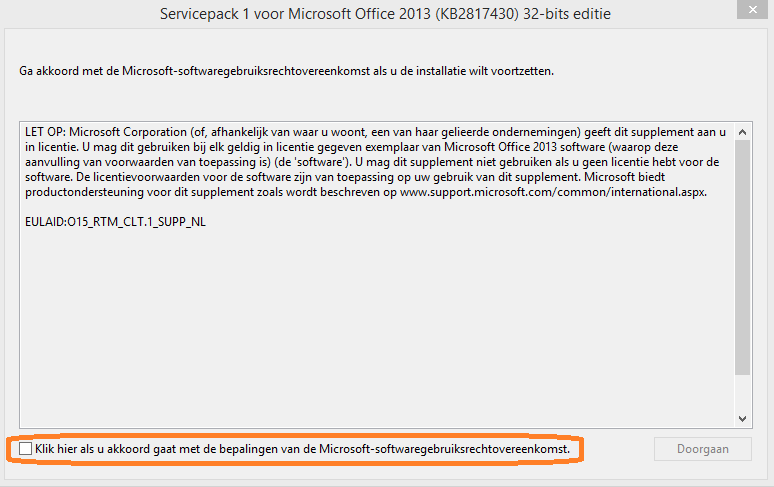 Accept the license information (note: despite the fact that I'm running an English version of my OS, and I've opened the en-us version of the Service Pack installer, it still somehow comes with the EULA prompt in Dutch...... VERY strange). After it's done, you can test it by running setup.exe. In my case, I've used a custom msp file, which makes the installation silent. 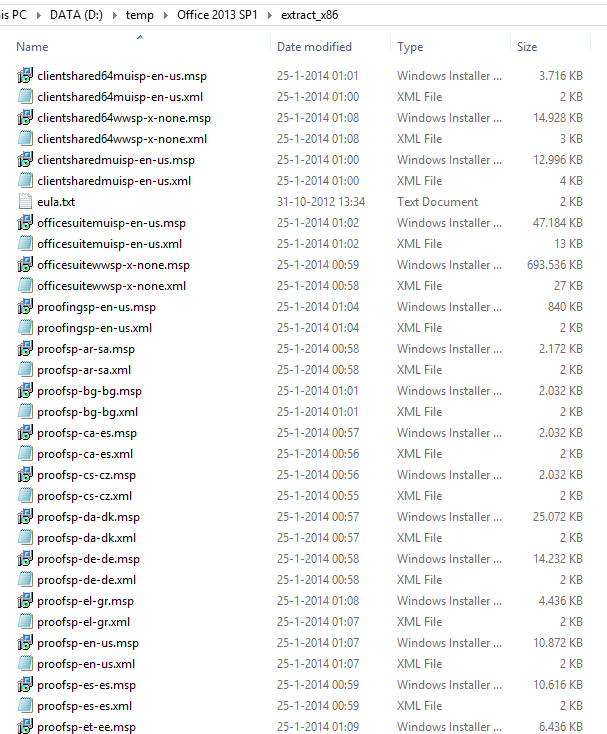 Note that if you have made a custom msp file, it still works, so no further customization is neccessary. 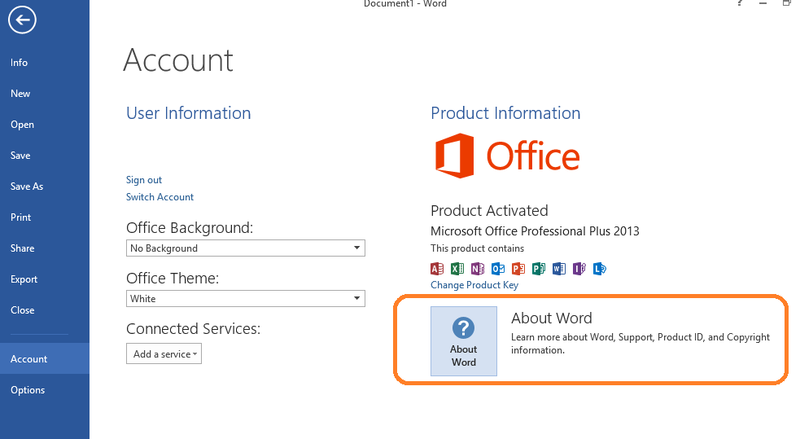 Once installed, you can open up Word 2013 for example, to check what version is installed. 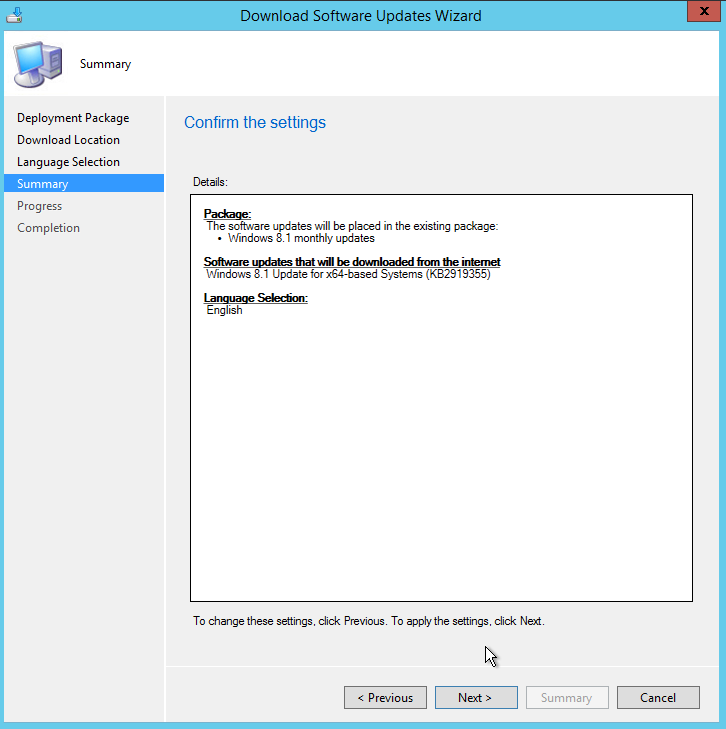 The version 15.0.4569.1506 is the minimum version SP1 is at. 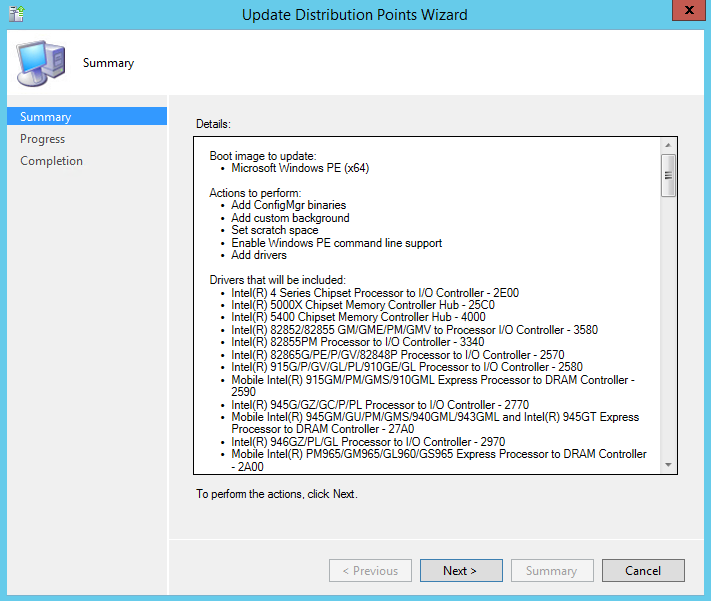 Any higher or equal number indicates that you have installed SP1 (this is the same for the 64-bit version). 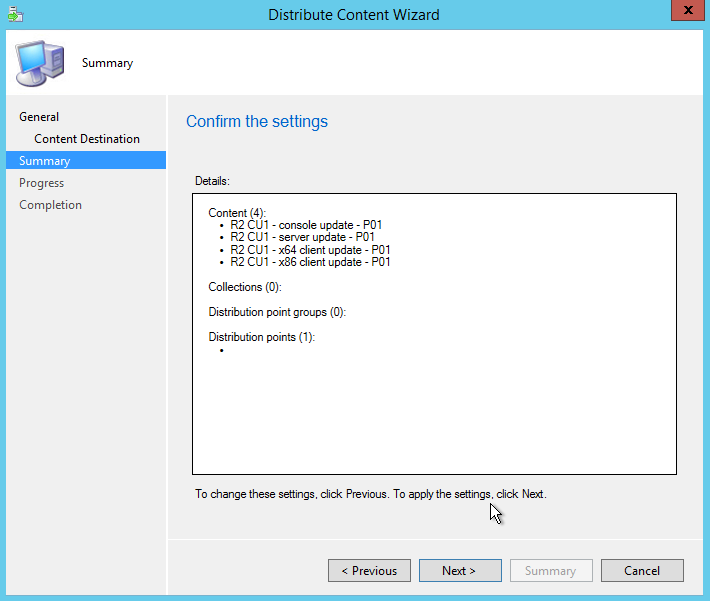 If you use SCCM, don't forget to update your distribution points! Welcome back! 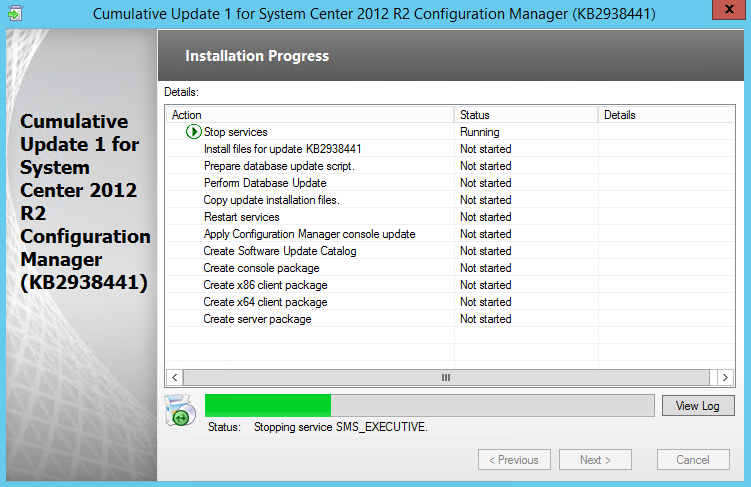 Today we'll discuss how to create a driver package in SCCM 2012 R2, and add it to a Task Sequence. 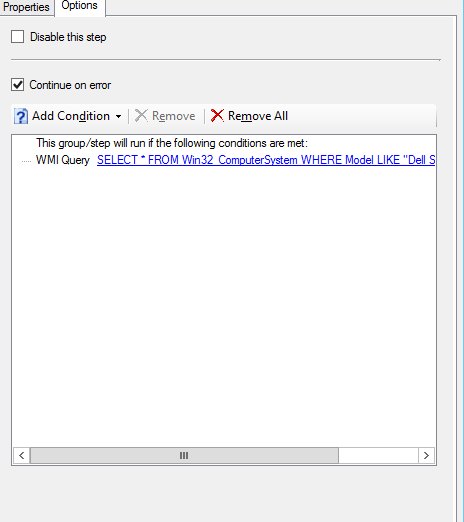 We will discuss how to use a WMI query in the Task Sequence, to distinguish the model to get the correct driver package. 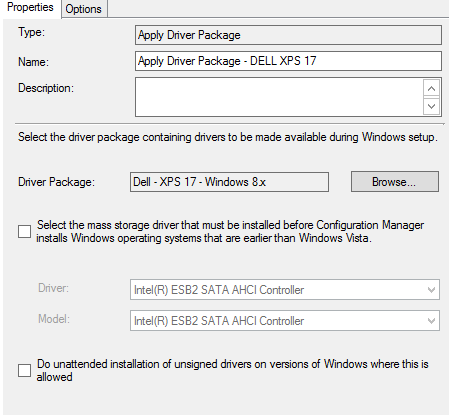 This way, we prevent that the wrong drivers will be installed on a certain device! 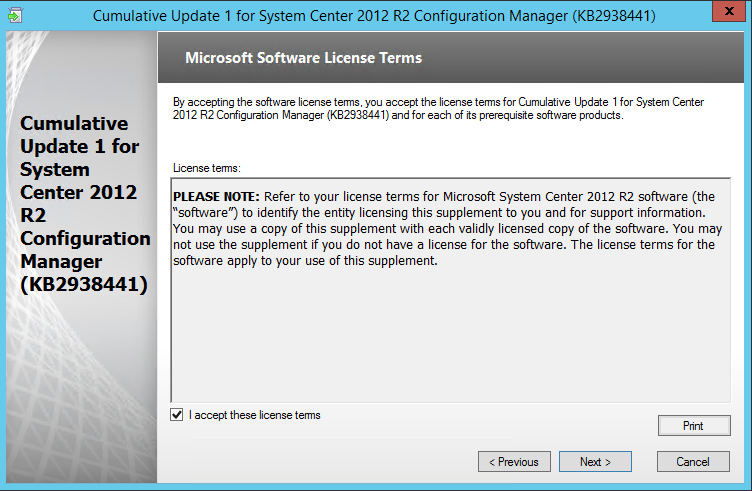 So lets start off by opening the SCCM console, and browsing to 'Software Library'. 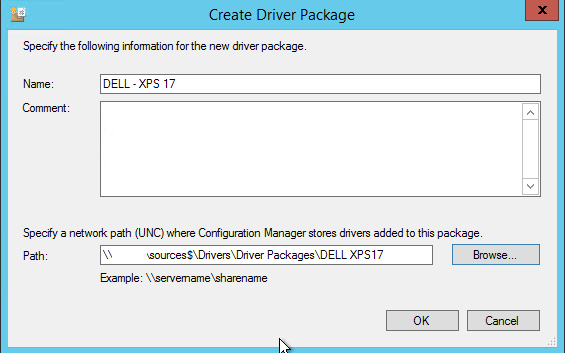 Give the driver package an appropriate name, in this case we are making a package for the DELL XPS 17. 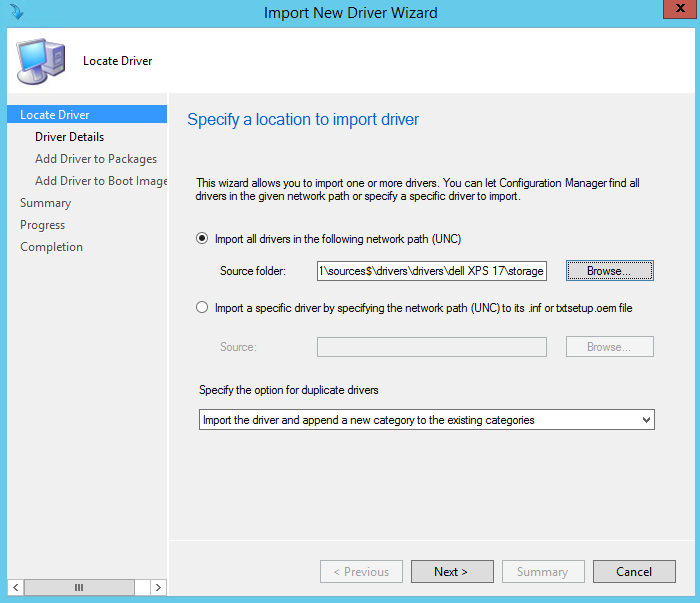 Point it to the correct UNC path, and click on OK.
Next, we'll import the driver to SCCM. 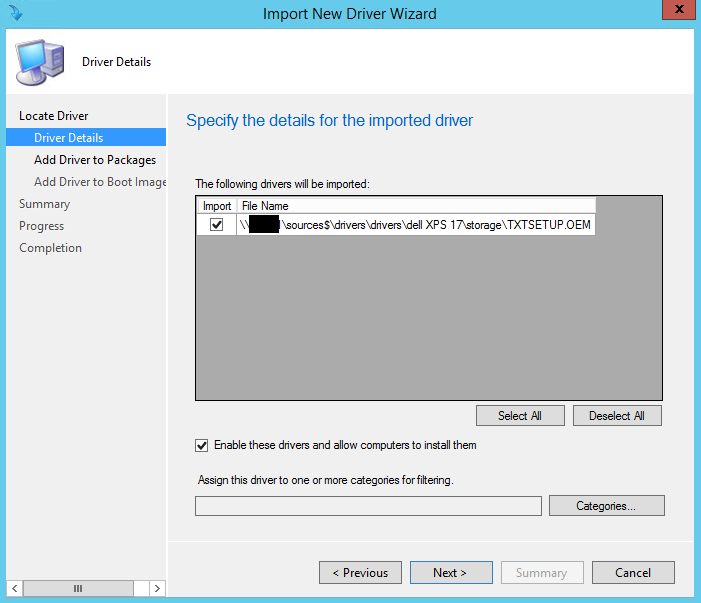 Rightclick 'Drivers', and click on 'Import Driver'. A Wizard appears. Choose the location of where the driver resides. Next, the wizard will show the recognized drivers. Optionally, you can create or select a categorie. 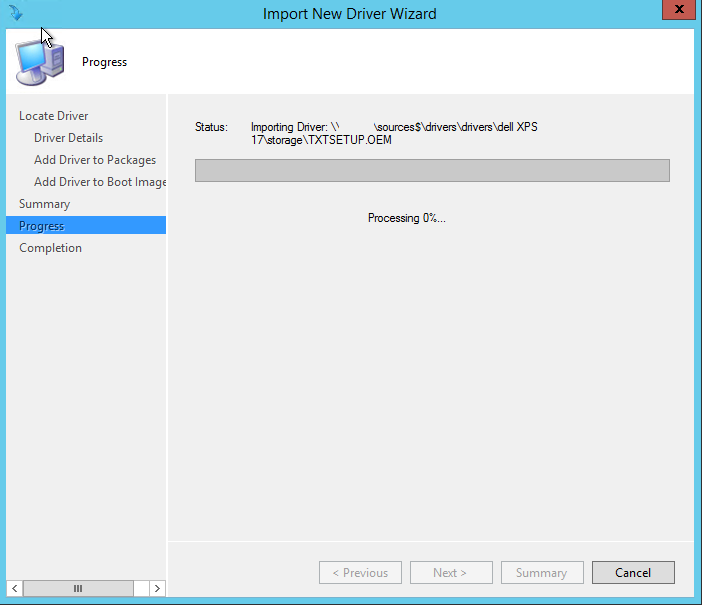 In this case, it's a Storage driver. 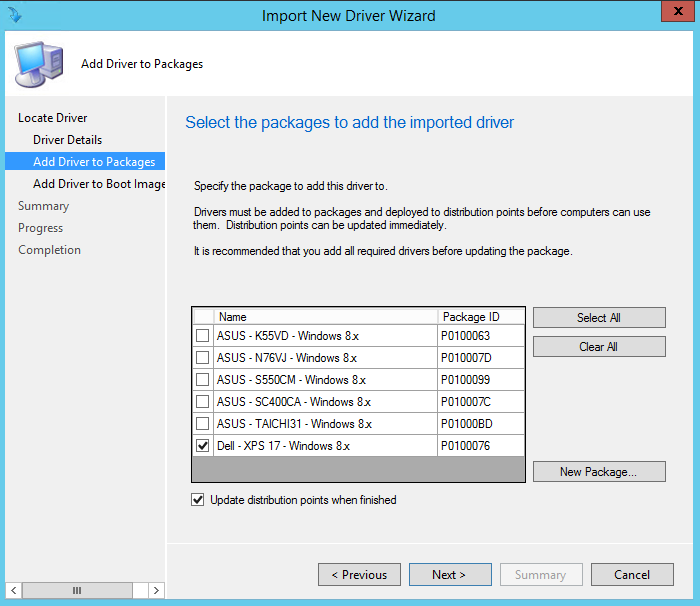 Next, choose the driver package where you want to add the driver(s) to. 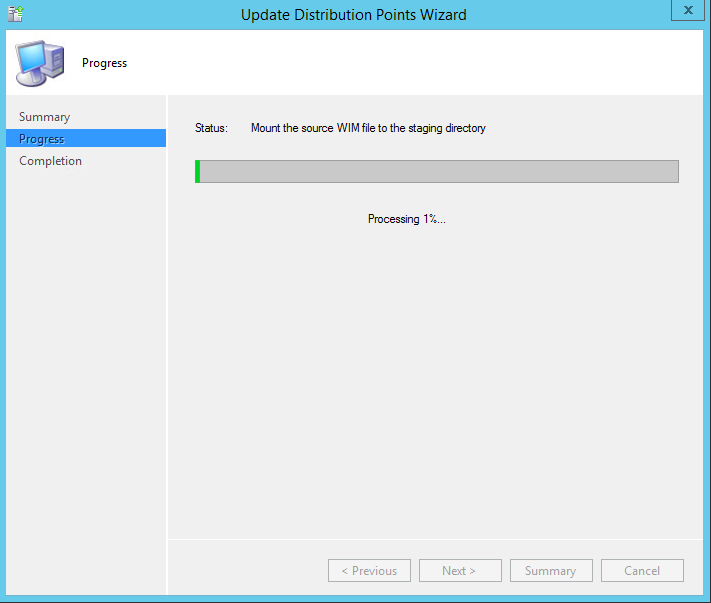 Optionally, you can check the checkbox 'Update distribution points when finished'. 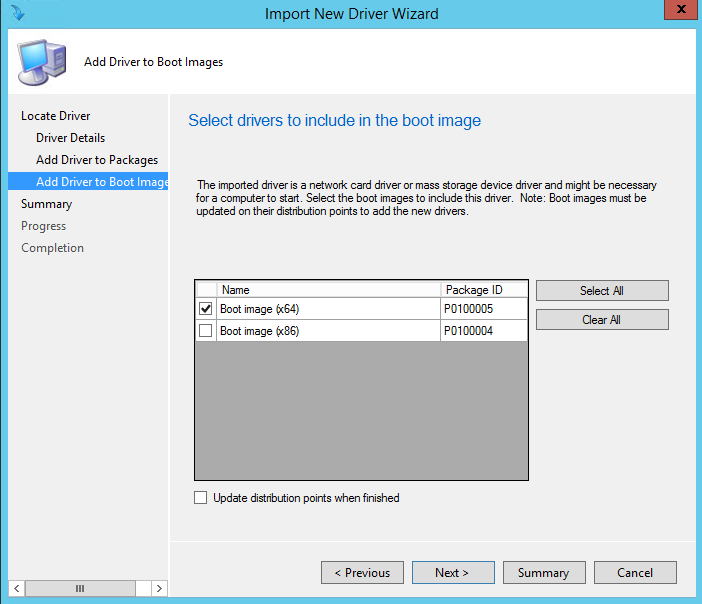 You can optionally also add the driver to a boot image, and update the distibution point when the wizard finishes. Check the details to see if everything is correct. The drivers are being imported. 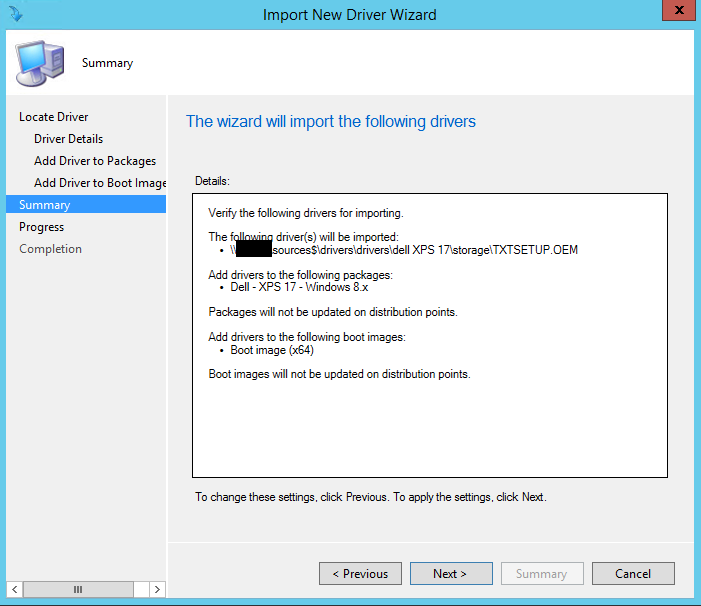 Next, you can update the driver package on the distribution point. 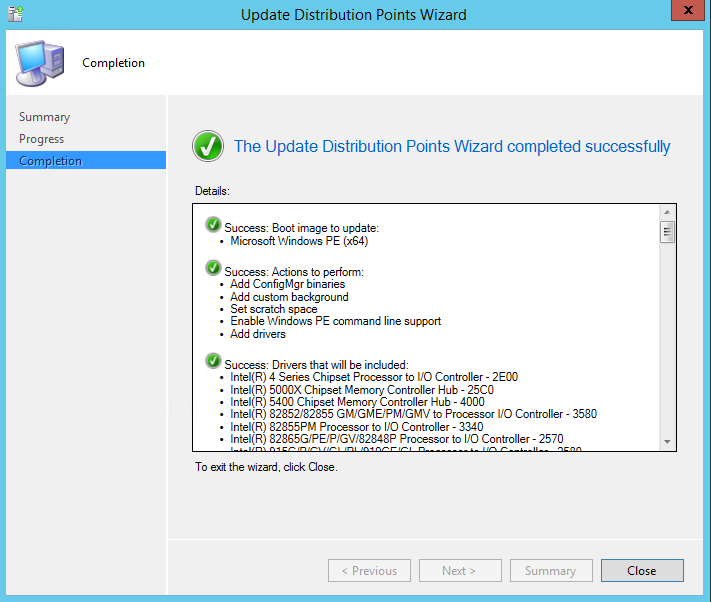 Now, you can update the boot image(if needed) on the distribution point. 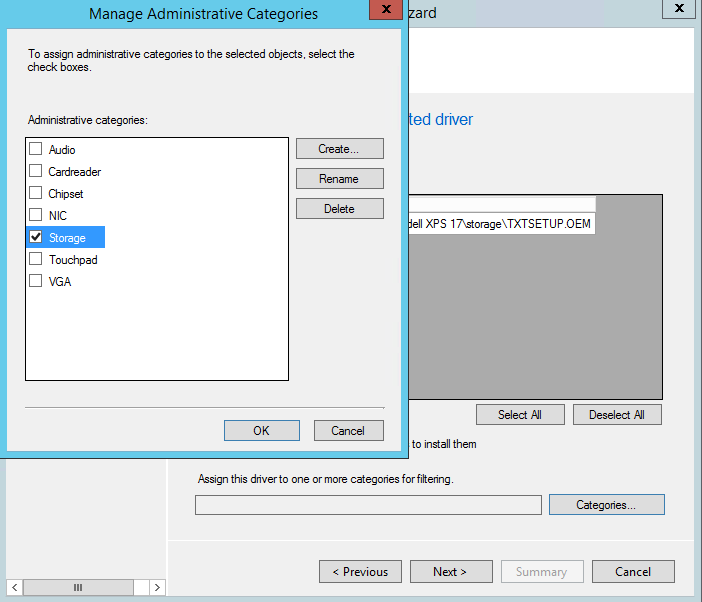 Now, you can edit the appropriate task sequence to include the driver package. 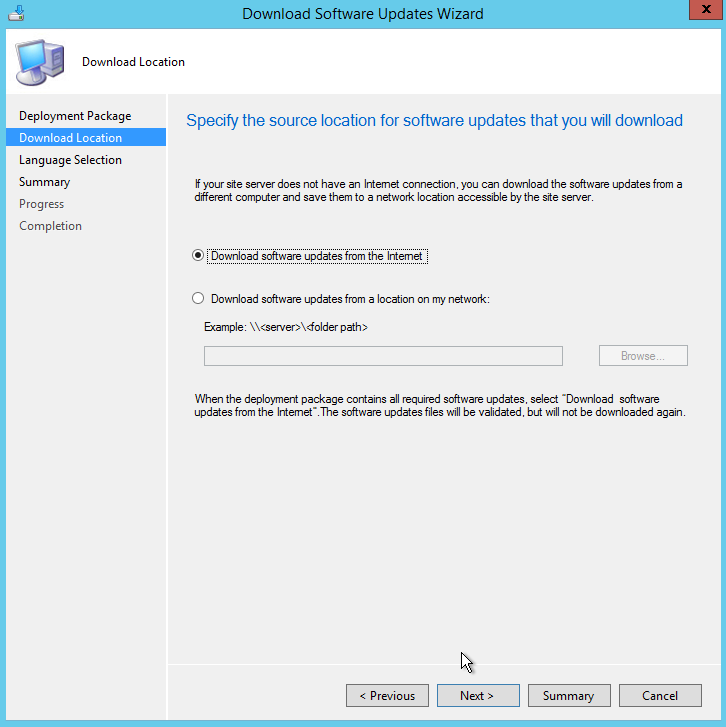 First off, it's wise to retrieve the WMI information for the specific model. 1. Open a command prompt on the model (in this case a Dell XPS 17). Copy and paste this information to a Notepad, so that you can use it in your task sequence in a moment. Add an 'Apply Driver Package' step, in the appropriate place in the task sequence. Give it the correct name, and choose the correct driver package. On the Options tab, using 'Add Condition', you can add a Query WMI rule. 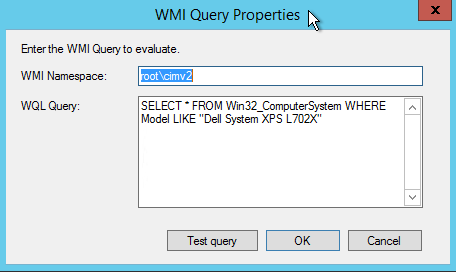 SELECT * FROM Win32_ComputerSystem WHERE Model LIKE ""
Put the model you got from the WMI query you ran, between the quotation marks. Click on Test Query. If it says that it contains valix syntax, the query should work. Save the task sequence. 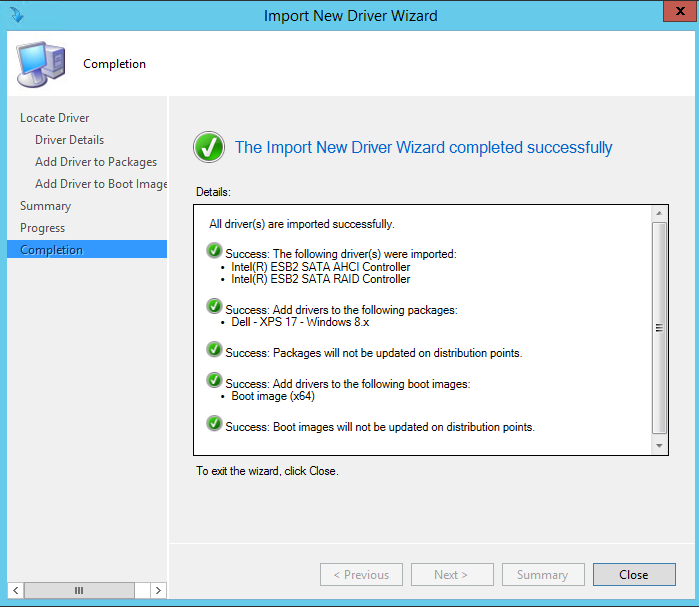 Now you are ready to roll out a machine with the correct drivers! Donate if you want to support IT-Immensa! IT-IMMENSA. Awesome Inc. theme. Theme images by enot-poloskun. Powered by Blogger.